Very effective detail work in the recesses there, Sixty. Now I see the glow through effect you are working on, I first thought it was just coloured recesses. Thank you everyone. I will try to post updateson the bone getting done as soon as possible. That glow is pulsatingly brilliant. Are you blushing electric blue? Echoing the others here, great looking glow! I've done lots of little bits and bobs, but nothing that has been worth posting. Tonight though, I got started on the next Wraithlord. Once again, I will take a cast of the blade. 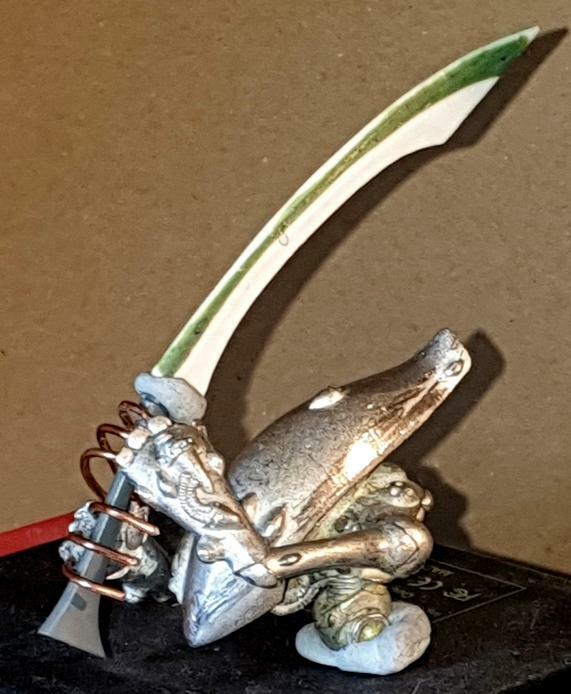 I plan to model him to be leaping forwards.Not quite sure how well the metal will support itself, but I'll cross that bridge when I get to it. 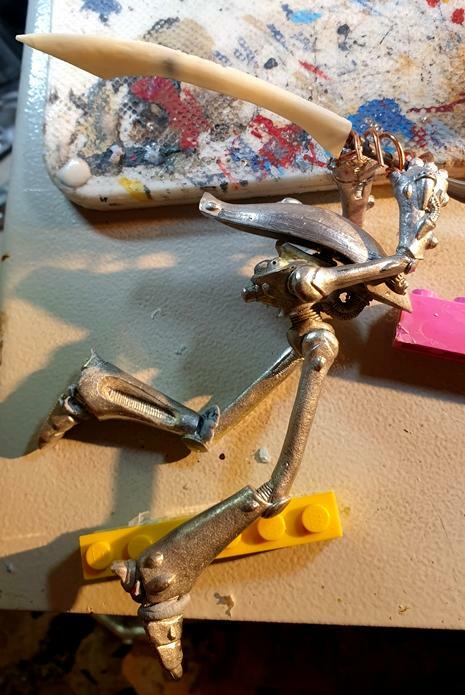 Ambitious going full sculpt with the fingers. Pose sounds like it will be quite dynamic. Looking forward to seeing how it turns out. 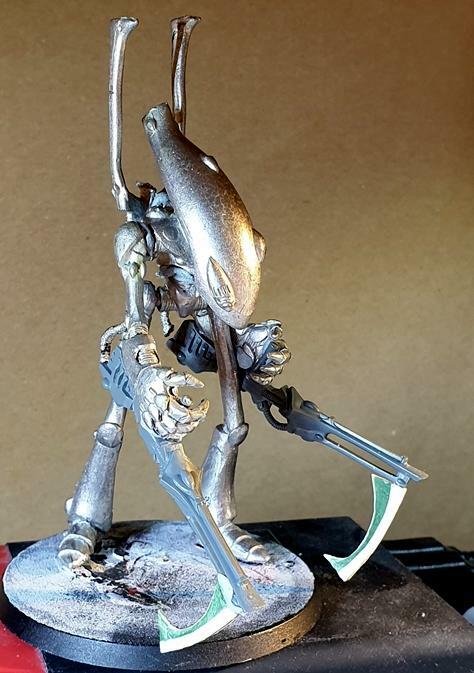 Now that is going to be a stunning wraithlord when it's finished. I have no doubts that you'll pull it off brilliantly. Looking forward to it! And here is the start of number three. Number one has his dual stub-shuricannons, and number two will only have flamers, so no heavy weapons. Number three will be back to dual-shuricannons. Not stub over-shoulder efforts this time, but dual-underslung cannons. Oh, and they'll both have blades on, like Maugan Ra. In fact, this will be Maugan Raithlord. Maybe I'll even build him a Ra-esque backpack and banner pole. That's an exceptionally cool idea. I just love when folk are not precious about old metals. Looks snazzy. 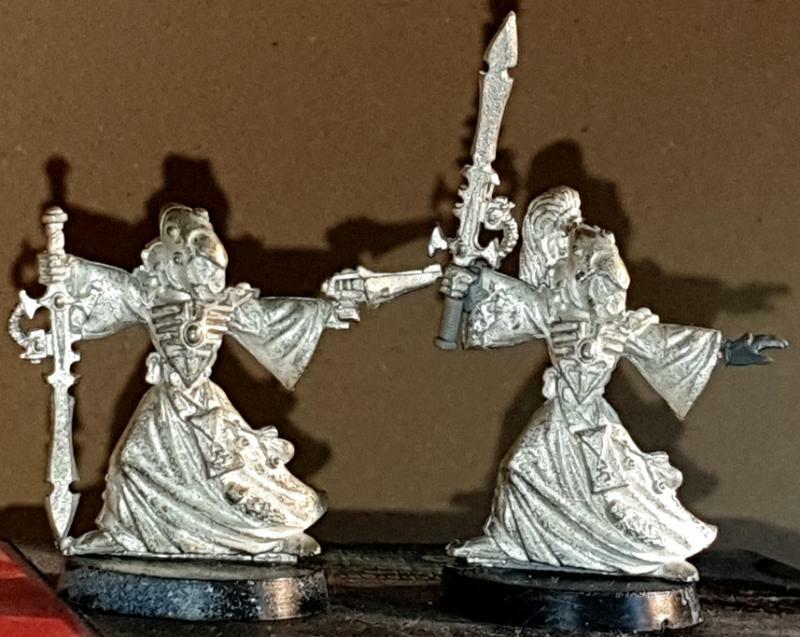 Interesting conversions to modernize your old Wraithlords. Love that... just love it! No work on overhead strike dude. 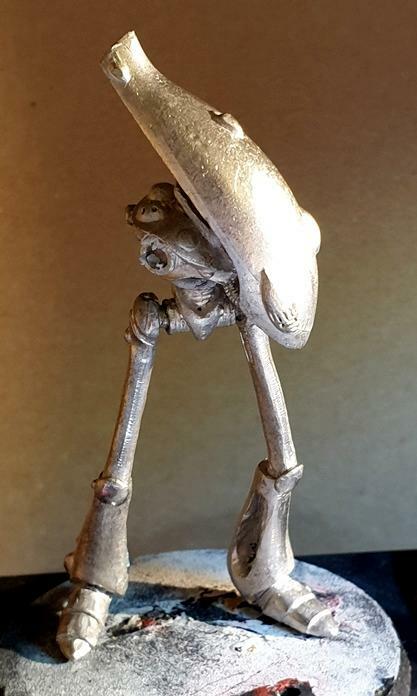 I need to work out how to pose his with his legs in a diving forward position, and still have sufficient support for a relatively heavy model. I also worry that if is at too much of an angle, he might bend his own things. I wanted to have him stood at an angle, so I took a razor saw through his torso and twisted him to his left and lined him up with his left leg. 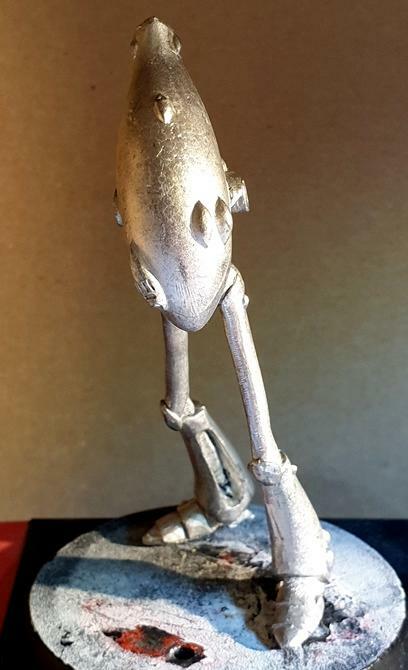 The legs are just posed using some 1mm copper wire at the hips.. It'll need some greenstuff work. 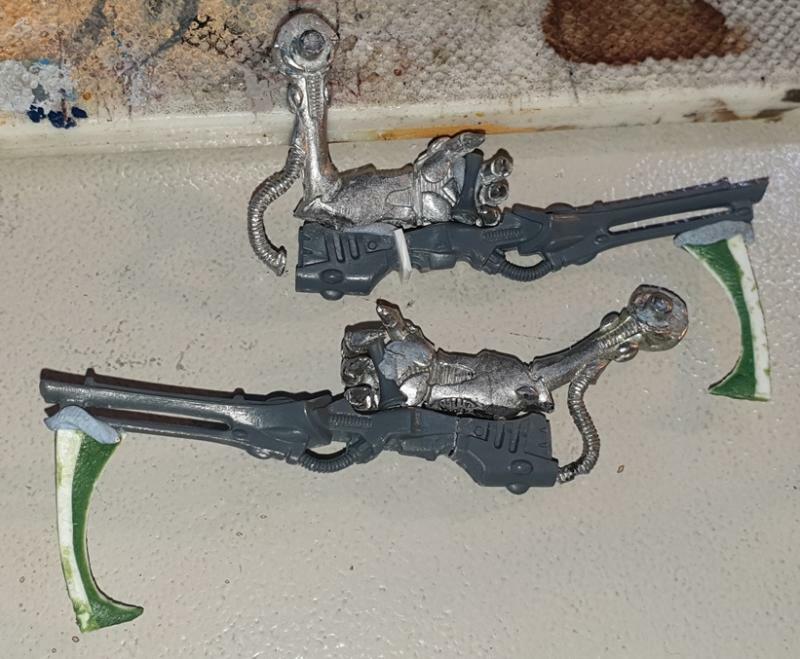 I have the blades ready for some final shaving and sanding, before affixing to the cannons. The cannons just need their handles fixing on. I was able to just twist the fingers using small pliers, so no need to build new ones using green stuff. 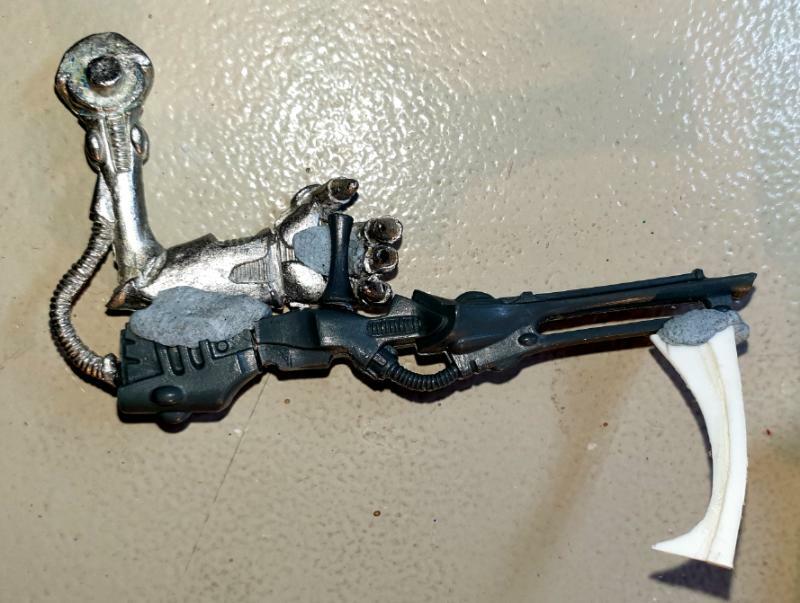 The other image is just of an arm with its catapult removed and replaced with a flamer. 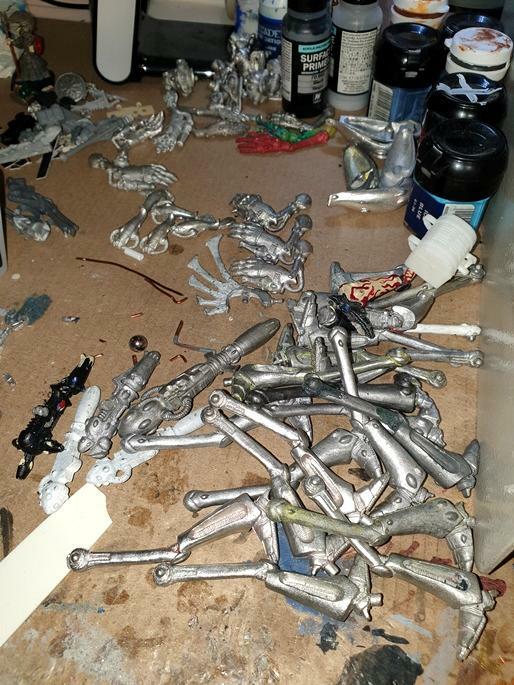 I'll also need to do two of those arms with no catapult or flamer at all to use for each of my Wraithseers. 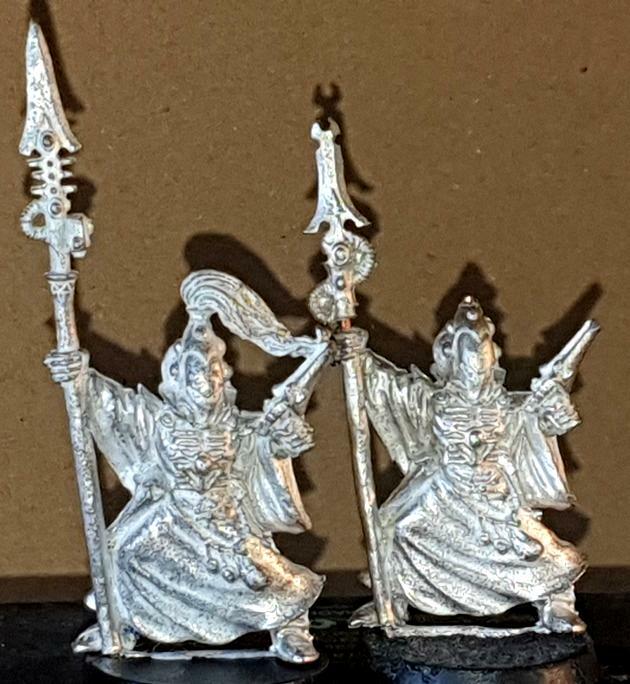 I plan to build at least two Wraithseers, maybe more, and I need one soon. Solid metalwork. Hard to believe it used to be that way for most all conversions. Very excited to see that one come together! I only just noticed that you called me Sixty! Ten of them, though I'll only use nine. I wanted them to be unique, so I did some cutting... I need ot do a little greenstuffing on the head of one of them. I hate the unmodified model on the left, and he won't be in the final ten. I am very happy with the right-hand version. I think he looks more naturally posed. You may be able to see where the topknot came from. The hand is from the dire avenger shield arm. I think the angle on the base might be important, so I need to be careful when I glue him in. That’s a lot of psychic shenanigans! Amazing metal work. I always hated it. Some things turned out OK, others just a pile of twisted shrapnel. Looking great.... the wraithlord will be epic. 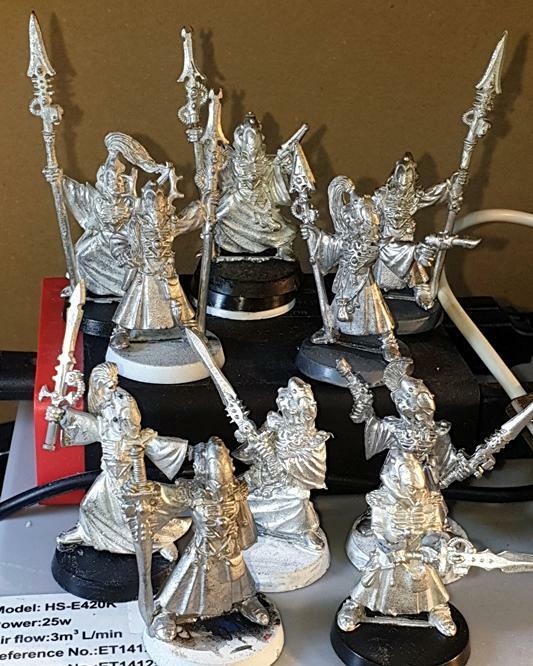 Doing the conversions in metal is harder, as some people have said, but I find it is mainly a matter of patience and not trying to force things. Quite often I find I can't cut where I want to, so I drill into a gap or two, saw or cut as much as I can, then wrap the part in something soft, before gently rotating or even just wobbling back and forth using pliers in order to get bits off. Then it is just a matter of pinning. Again, people complain about this, but as long as I use a sharp point to make sure you start off your hole where you want it befre switching to the pin vice, I rarely have a problem. 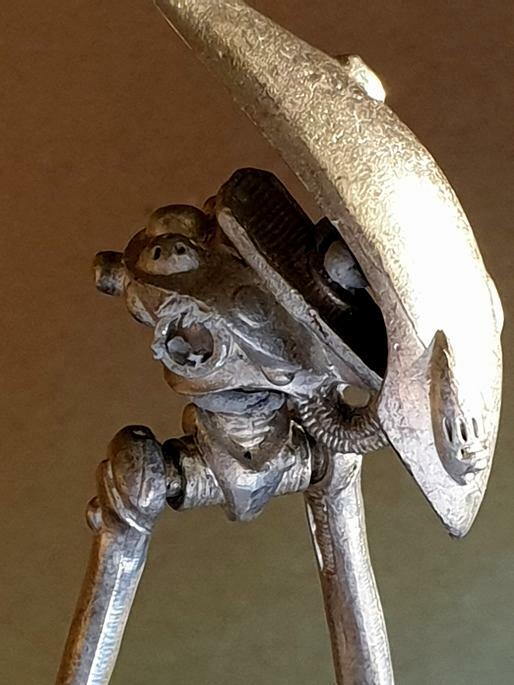 For some reason, a metal conversion feels more "proper" to me than a plastic one. 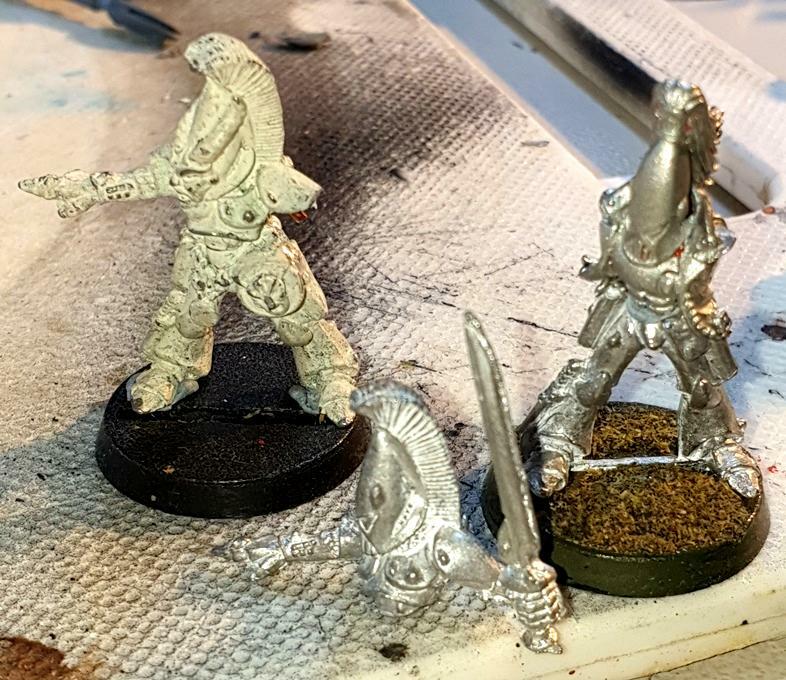 And even though I have enough Stom Guardians (for now) I played around making some more unique ones.. The guy with no legs will be a jetbike rider to mix things up a little. 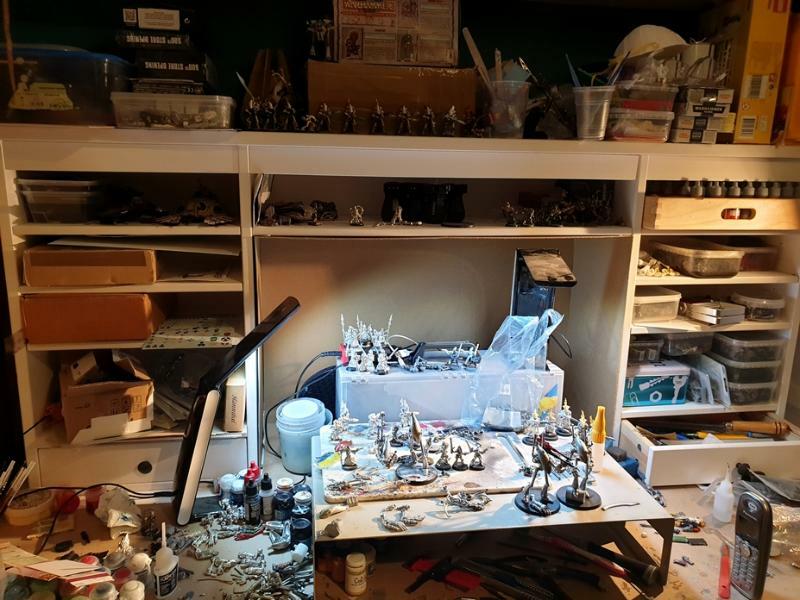 This is most of my Wraithlord bits. The bits that are already part of a WIP model are not there, obviously! 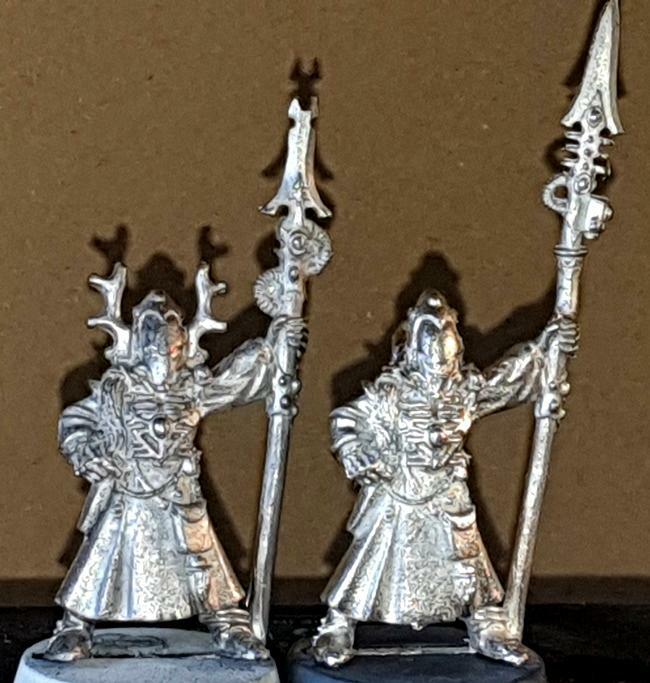 And I did a bit of work on posing Wraithlord 2 and 3 (aka Maugan Raithlord). 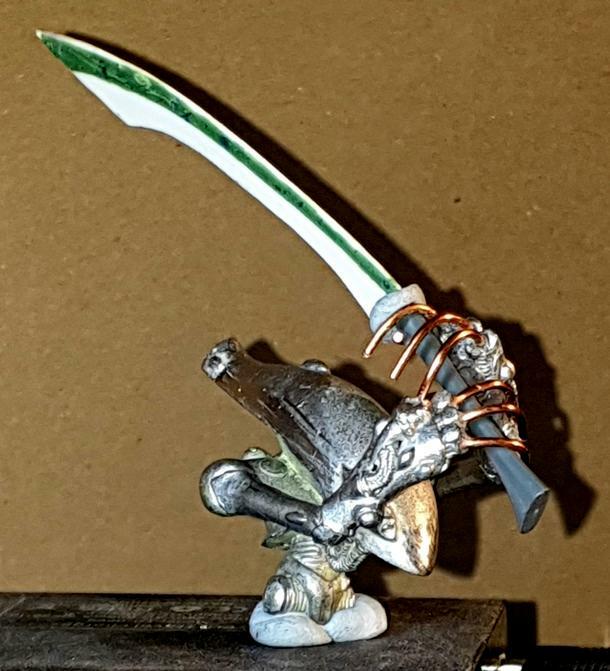 I also cast another wraithblade. Something about those underslung, scythe-sporting arms says to me that a “Come at me Bro” arms-out pose might have been fun. Excellent the way you built him. That’s a huge pile of old lead. I should sift my own and see if there is anything salvageable in it. Some old stuff just don’t have rules these days. That is just a dry-fit for now. 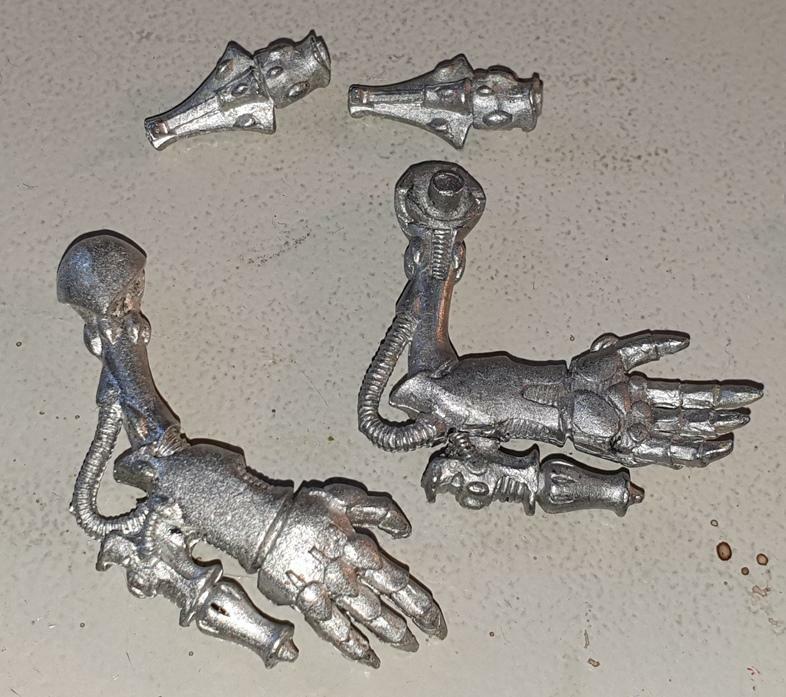 The arms are only loose on their pins, so still very moveable. The pose you describe is the one I am hoping to make look good, so hopefully I can give you what you want. I am very happy you have found a use for that Jetbike rider body. 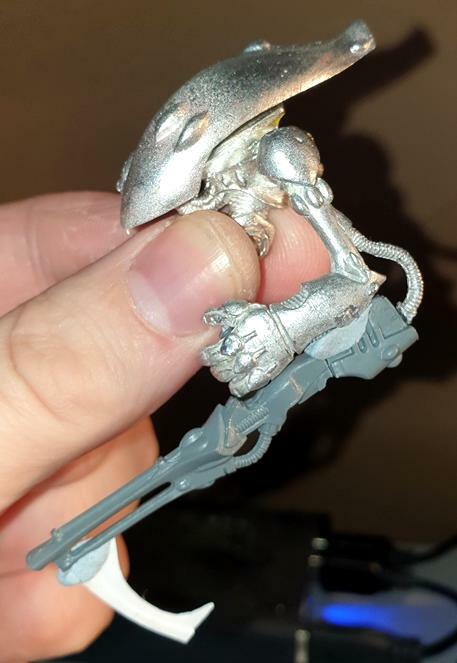 Very good work on the metal parts.